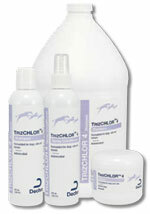 You are buying the Dechra TrizChlor 4 Wipes For Dogs And Cats 50/bx, model #TCW. At ADW Diabetes, we offer a wide selection of Dechra products for cats and dogs. Shop with ADW Diabetes and save on all of you pet health care and grooming supplies. The Dechra TrizChlor 4 Wipes For Dogs And Cats 50/bx is for support of healthy skin for animals with conditions responsive to chlorhexidine. These conditions include: superficial bacterial and fungal skin infections, acute moist dermatits (hot spots). Effective against multi-drug-resistant Staphylococcal infections. Contains no alcohol; is non-irritating to ulcerated or abraded skin or ears. Use in conjunction with Muricin (mupirocin 2% ointment) on focal areas of infections. Recent in vitro study of chlorhexidine shampoos (2%, 3%, 4%) demonstrated equivalent and excellent minimum bactericidal activity against S. pseudintermedius (methicillin-susceptible and methicillin-resistant) at 10 min incubation time. Patented, USP Tris EDTA composition.